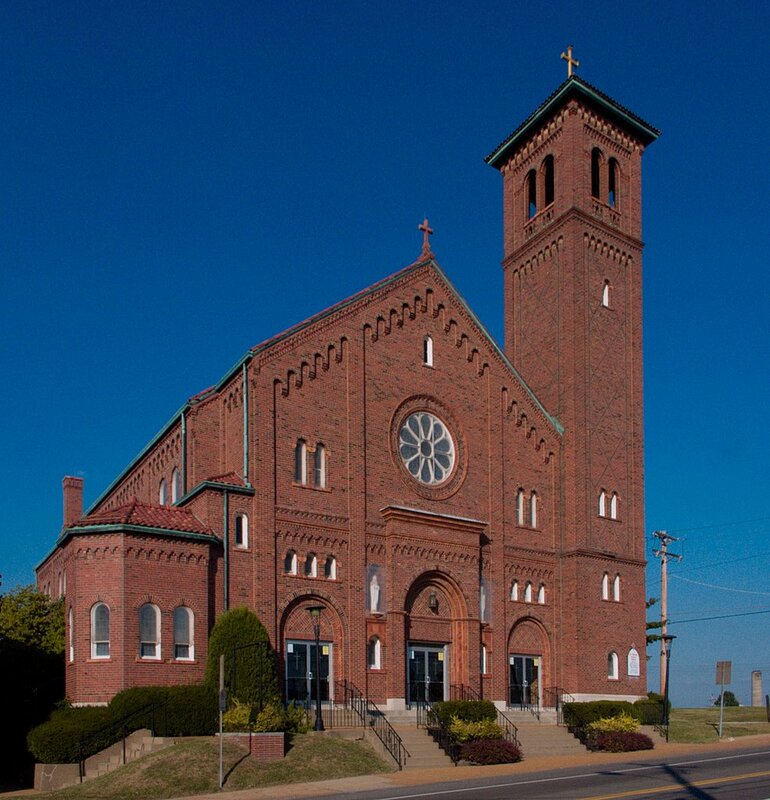 Saint Andrew Parish was founded on December 24, 1904, and was the first parish located between the River des Peres and Jefferson Barracks, which at that time was a major army base. The church itself dates from 1930. Lemay is an unincorporated community located just south of border of the City of Saint Louis (the border roughly follows the River des Peres) and next to the Mississippi River. The name "Lemay" comes from one of its major thoroughfares, Lemay Ferry Road, which in turn is named after François Lemai, a ferryboat operator on the Meramec River just south of here. La Rivière des Pères—French for "the Stream of the Fathers"—was the location of the first European settlement in the area, a Jesuit mission to the Kaskaskia Indians. This stream, now channelized, has been the source of much tragic flooding in Lemay in the 1990s, forcing many parishioners of Saint Andrew's out of their homes. The low-lying neighborhood just to the northeast of the church was subsequently demolished and converted to a park. 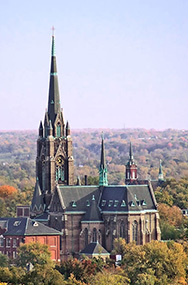 The church itself sits on high ground and can be seen from a long distance. The land from Lemay to Jefferson Barracks were once the common fields of the French colony of Carondelet (now a part of the City). But legal problems with title to this land prevented significant development of Lemay until after the American Civil War. The area then became settled by German farmers fleeing the persecutions of the liberal German government under Bismark. 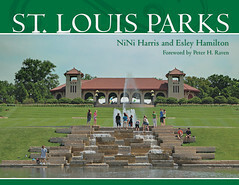 Significantly, many areas of Saint Louis County that once had large settlements of Germans remain unincorporated to this day; perhaps this is due to a long-held distrust of government. 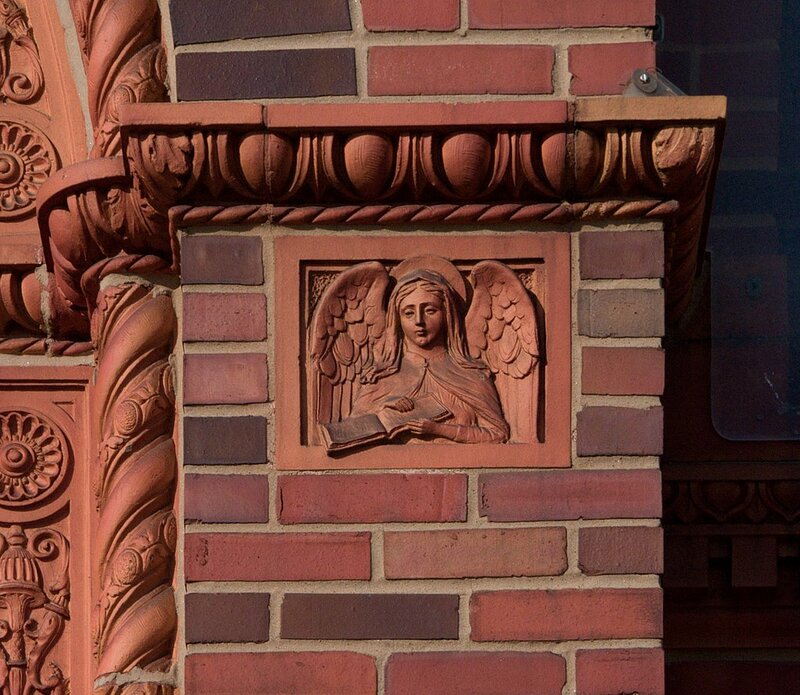 To the right of the main door, an angel holds scripture. 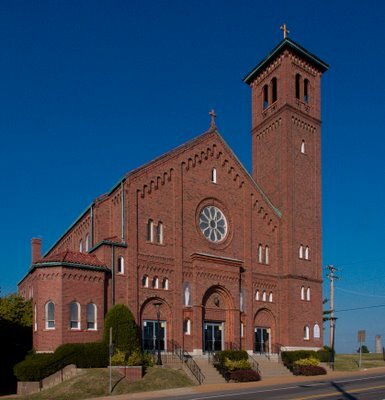 Many churches in Saint Louis of this era were made with decorative multi-colored brick and terra-cotta ornamentation. 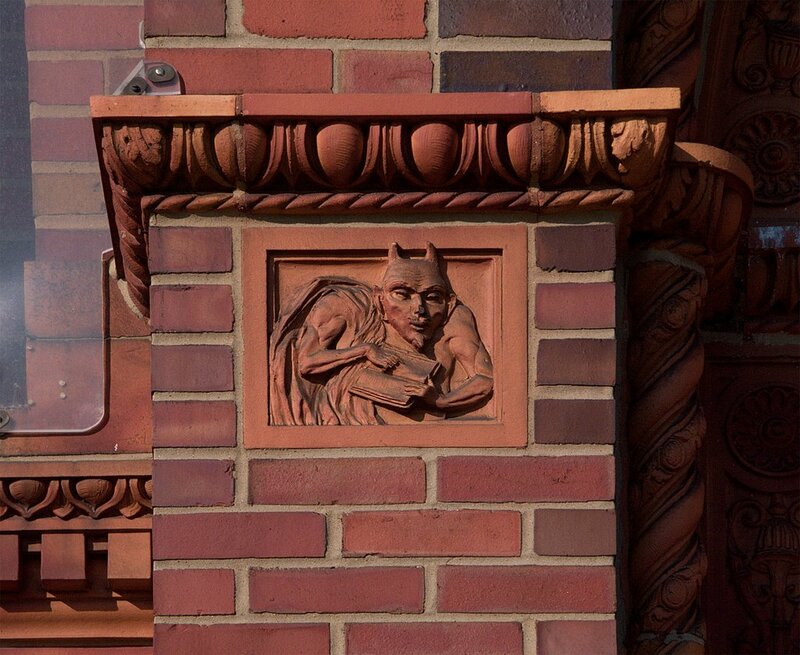 Holy Scripture, Batman! To the left of the main door, the Devil appears to be tearing pages from the Bible. Grotesque or comical figures have been common in church architecture, especially on the outside, symbolizing sin or folly. The school closed in 2003. 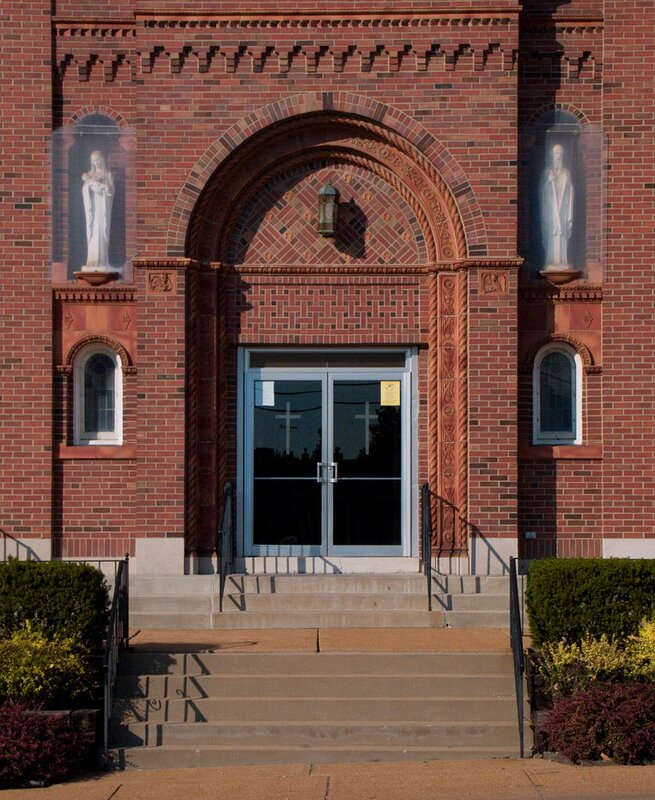 A great tragedy of the past number of decades is the sharp decline of the Catholic schools. The Supreme Court decision to eliminate public funding for parochial schools, and the loss of vocations to the teaching religious orders, made Catholic education unaffordable to the poor and to most of the middle class. This is not only bad for Catholics, but also the general public. 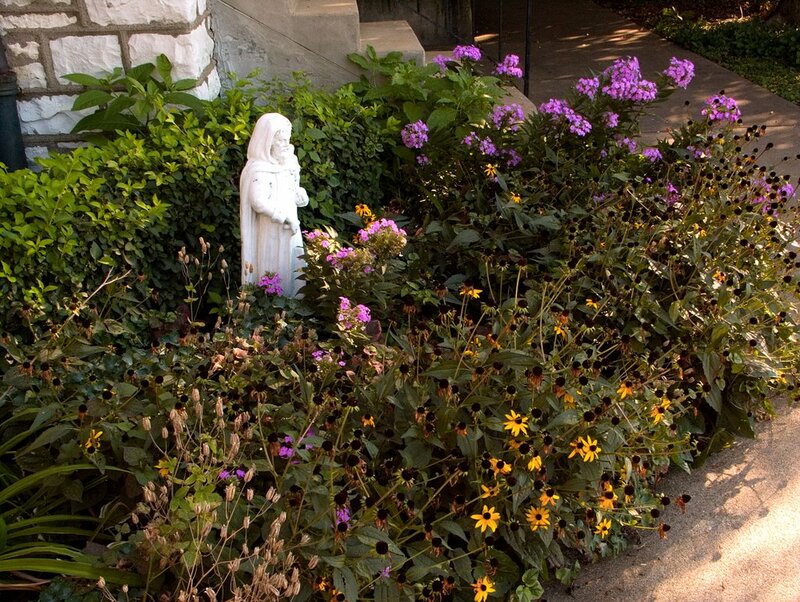 Catholic schools were usually superior to the public schools, and were far more affordable than the private schools. This put pressure on the public schools to increase standards. This competition is now gone. Saint Andrew was a fisherman, disciple of John the Baptist, Saint Peter's brother, and Christ's first apostle. 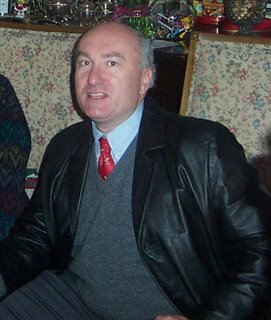 Acording to the Catholic Encyclopedia, Andrew spread the Faith in "Cappadocia, Galatia, and Bithynia [in Asia Minor, now Turkey], then in the land of the anthropophagi and the Scythian deserts, afterwards in Byzantium itself, where he appointed St. Stachys as its first bishop, and finally in Thrace, Macedonia, Thessaly, and Achaia [now mainly Greece]". Galatia, although now a part of Turkey, was home to the Gales, now known as the Celts, who have since moved towards the British Isles. Anthropophagi, by the way, means "cannibals". Scythia is a vast area which generally comprises much of the old Russian Empire, and Saint Andrew is patron of Russia. Andrew was said to be executed on an X-shaped cross in Greece, and since he was bound, and not nailed to it, he was able to preach the Gospel for two days before dying. Note the X-shaped brickwork on the church; this may not be coincidental. Many of Andrew's relics were taken to Scotland in the 4th century; eventually he was declared the patron of Scotland, and the flags of the United Kingdom and of Scotland contain the cross of Saint Andrew. His feastday is universally celebrated in the Western and Eastern Churches on November 30th. The name Andrew comes from the Greek andreia, meaning masculine. 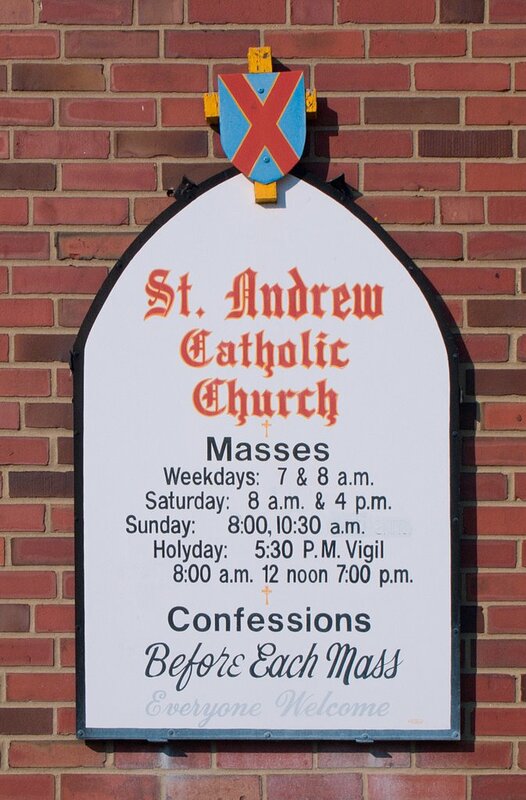 Isn't it encouraging to see a parish that advertises confessions before every Mass. So many parishes offer confession only once a week. Of course, "and by appointment" usually follows the once a week text. But I if our priests would log a few more hours each week in the confessional we would all be the better for it. 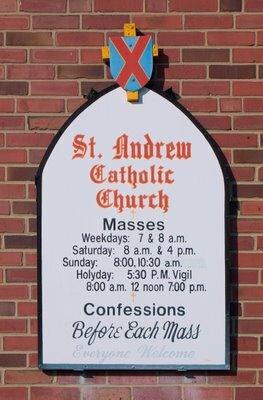 This has been my parish since the day I was baptized almost 62 years ago. Confessions have always been offered before the masses. Our parish has withstood a huge loss of members but we're still going strong. I've belonged to this parish since 1957. My mother went to school here and herds of other relatives went to school here. I've visited other more modern churches but never really felt like I was in a (real) church. St Andrews is beautiful. This church looks almost just like St. George Catholic Church in Afton. Beautiful!!! These are beautiful pictures of the church. My Great-Great-Great Uncle was the first pastor at this church. 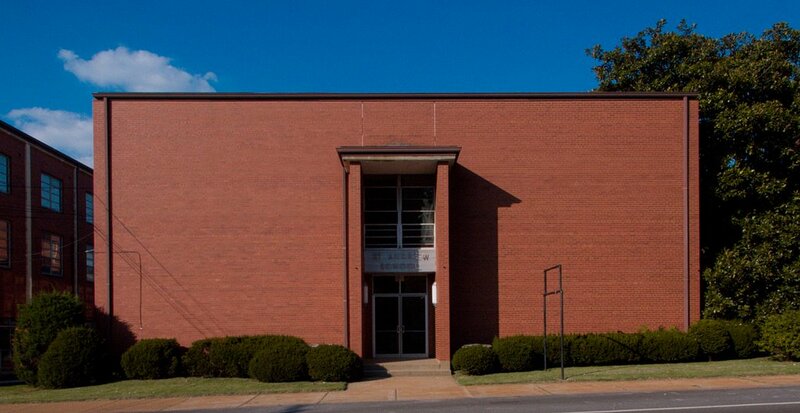 My Grandfather is researching the history of this church. 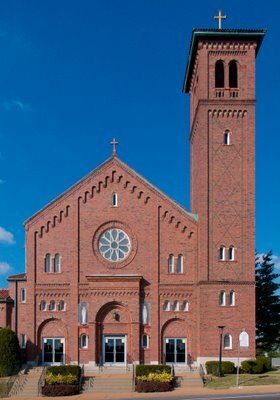 Would anyone happen to know who the architect would be for this church? 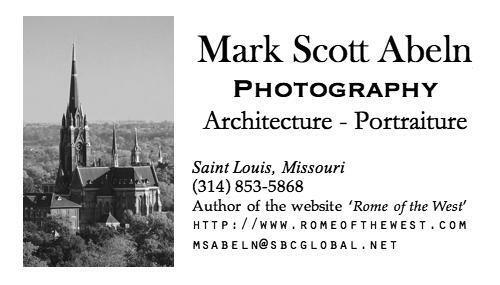 A relative of the architect and builder called me; his name was Frank X. Kratzer, who also did St. Hedwig’s and St. Mary’s hospital in East Saint Louis, Illinois. Please let me know when you have more information on this church. I also would like to get interior photos of it soon.